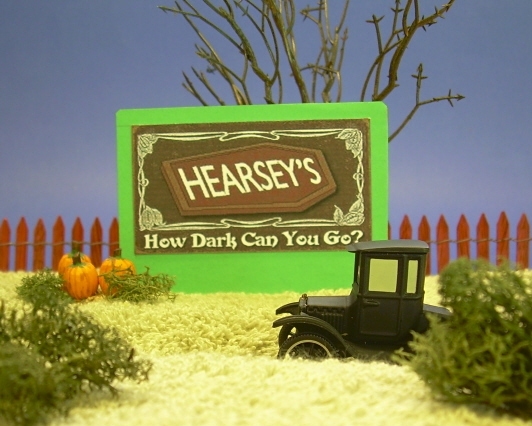 Note from Editor: Project designer Howard Lamey has begun a groundbreaking series of vintage-style cardboard structure projects just for Halloween. After he made a great train station, I sent him a couple signs for him to use, and he decided to use them as billboards. 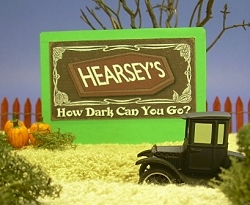 This is a quick "how-to" on doing the same thing for your Halloween village. 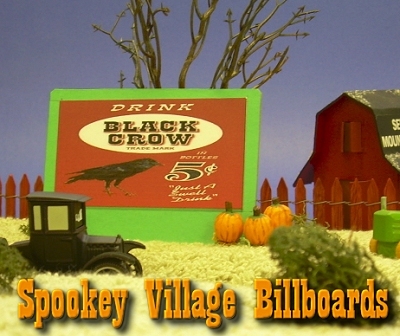 These billboards are easy additions to the Spook Hill™ community of custom-built, vintage-style Halloween display village houses. 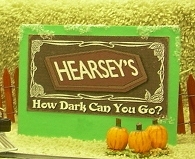 They would also look good with any Halloween village, including the Hawthorne Village® Halloween trains and Villages. It's also the easiest Spook Hill™ structure to build so far, so it would be a good project to get the kids involved with. Clean cardboard (used is fine). The best kind for this project is heavy chipboard, that is - thick, but solid cardboard like that on the back of writing tablets. If you don't have that, you could alway use fine corrugated cardboard like the kind the post office uses for express mail, and paint it in such a way that the paint smooths out the rough edges. Note for Outdoor Railroaders - If you're making billboards to go outside, consider using a weather-resistant material like thin plywood, Lucite glazing, or road spam (those obnoxious fluted plastic signs they put on your street corner in the dead of night). I'd also consider using stakes to install billboards outside instead of "stands," as shown in this article. If you want to use them for a Large Scale railroad, or if you want to resize them yourself, download the jpg version (a 1.7meg files). If you do that, try changing your printer to landscape mode and printing them as large as your printer will allow. If for some reason, this doesn't work out for you, contact us and we'll try to help. Once you've printed the advertisements in the size you think you want, cut them out and lay them on a piece of scrap paper. Draw a box around each one that is between 1/8"-1/2" on the top and sides and 1/2"-2" on the bottom. Adjust the "box shape" until it looks right to you. Then use that as a pattern to cut out the supporting wall and any material you choose to use to cover it. 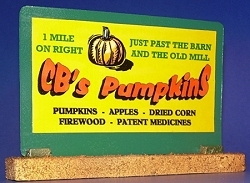 For each billboard, cut out a pieces of heavy cardboard the size of the box you drew around your advertisements. If you want, you can "nick" off each top corner to give it a more finished look. 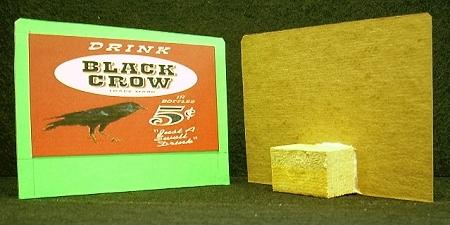 Paint the cardboard, including the top and side edges of the walls with black paint. Again, if you have used thin corrugated stock, you can use the paint to disguise the rough edges somewhat. Cut out the advertisement(s) if you haven't already. 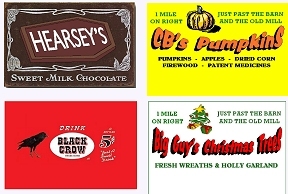 With a fine black marker, felt tip pen, or acrylic paint, carefully coat just the edge of the paper or card stock that the advertisement is printed on. Apply the printed graphic to the supporting wall. Center carefully so that the distance from the top and sides is the same, apply glue and press in place. Glue the advertisement to the supporting wall. Glued to the billboard's supporting wall. Apply several light coats of acrylic satin spray to provide a protective finish. Don't try to put one heavy coat on at first - the ink from your color printer may run, which may not give you exactly the effect you were looking for. If desired, when all the glue and satin spray has dried, use clear glitter sprinkled over Elmer’s Glue-All to add little touches of frost. 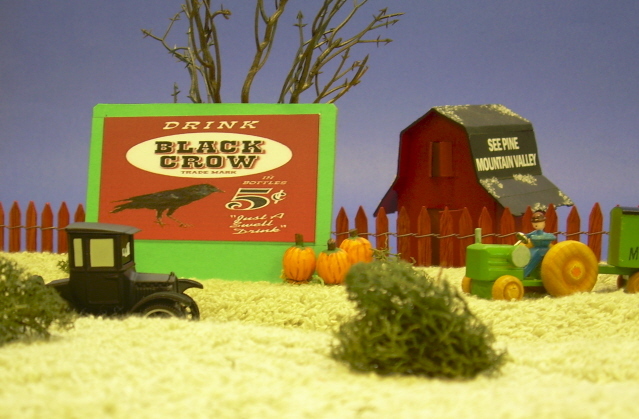 Paul speaking here: When Howard was done taking photos for this year's Spook Hill projects, he sent me the Black Crow and Hearsey's billboards, along with the station and water tower he had built while creating this project. 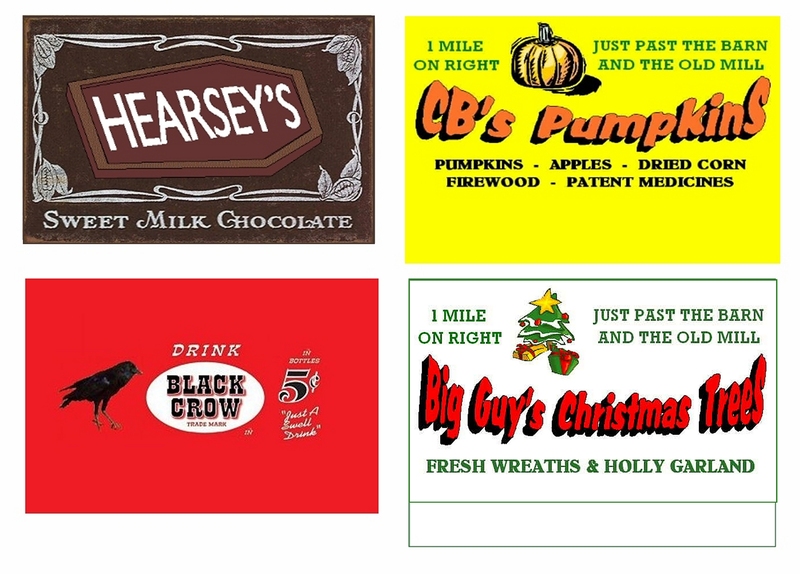 Due to Howard's careful craftsmanship, these fun projects have produced what could easily become a family heirloom. Once again, I am glad to be able to help Howard bring his project ideas to our readers. Once you do a couple of these billboards and try them out on your village, you'll be looking at print advertisements and cardboard packaging for more ideas. Howard has often been "commissioned" to design and or build vintage-style cardboard houses for collectors and fans of this delightful, but underrated art form. That's why he started his own web site, LittleGlitterHouses.com. If you would like to ask Howard to bid on a project for you, or if you have any questions for Howard, stop by there and you'll find direct contact information. If you have any questions for Paul, use this link.